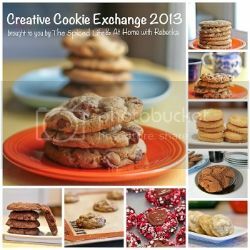 It’s time for another Creative Cookie Exchange! This time our theme is a very seasonal apples; I love apple desserts and dishes in the fall, so the choice was really a no brainer. Anything apple counts–I am kind of embarrassed to admit that in this time of (fresh picked apple) plenty, I used dried. Picture my embarrassed face. I found the cutest little bag of dried apples mixed with (about 4:1 ratio) dried cranberries and just instantly knew I was using them. Amusingly, it turns out I am not very good at varying my apple desserts. I suspect if you did a search on here you would discover that every single apple dessert I have includes streusel. If I had made these bars with, for example, dried cherries, I would have just left them as oatmeal bars. But because I was thinking apples, I had to find a way to add cinnamon, crumbly brown sugar, pecans and oats. It is like a compulsion. And I cannot say I regret that fact, even if these are kind of over the top. The topping itself turned out a little loose; Alex helped me bake these (what am I saying? she basically did it all) and when I told her to add 1/4 cup of flour to the streusel topping, she used the 1 cup measuring cup (my back was turned). In my attempt to fix it, I did not add enough extra butter. So eating these was a bit messy–but they were all eaten, so clearly we were not dissuaded. 1. Write a blog post with recipe and original photo. The theme this month is apples. The recipe can use apples in any form-dried, fresh, apple butter, apple brandy, you name it. We would like the recipe to be one you’re making for the first time, and photos must be original. 3. Make a good faith effort to visit and comment on the other cookies in the Linky party. We all love cookies so that should be easy! Salted Caramel Apple Popcorn Cookies from It’s Yummi! Preheat oven to 350 F. Grease a 9-inch square baking pan and line with parchment paper, leaving an overhang on the sides. Set aside. In a large bowl, whisk together the flours, salt and spices. Mix in the dried apples and cranberries and oats. Set aside. Whisk together the butter and sugars. Whisk in the eggs. Pour into the dry ingredients and fold until combined. Scrape the batter into prepared pan and level with a spatula. Whisk together the flour, salt, cinnamon and sugar for the streusel topping. Mix in the oats. Rub or cut the cold butter into the oat mixture, and then mix in the chopped pecans. Squeeze the streusel topping into clumps and then sprinkle evenly over the oatmeal dough. Press lightly into the oatmeal dough. Bake until a toothpick inserted in center comes out with moist crumbs attached, 25 to 30 minutes. Cool completely in the pan. Using paper overhang, lift cake onto a work surface; slice into bars. Streusel paired with apples should definitely be a MUST. Actually streusel should just always be a MUST. No matter what. I do believe that “more is more” so I am completely behind the addition of streusel. I add it every chance I get as well. I love this group and love your apple oatmeal bars, Laura! Keep going with the streusel, love those cookies. They look perfect!! Happy to finally make it to my first Creative Cookie Exchange!! Laura, your cookies look so yummy! I’m with you in saying this is a great group…wonderful recipes, and awesome people! Thanks for hosting The Creative Cookie Exchange with me, and getting all the little details worked out without pulling out all your hair! Streusel gets me every time and it is such an awesome pairing with apples. Funny about the extra flour. I bet that would take adding a whole lot more butter and all to make it the right texture. These look like the perfect treat with a warm mug of Apple cider! Yes, keep going over the top if you continue to create beauties like these! I think they are perfect for autumn, although I’d eat them yearround– that is the added bonus of using dried fruits. So glad you do include streusel with apple, Laura. Your apple oatmeal bars do look irresistible with all the wholesome flavors of oats, brown sugar and apples =) Thank you for this very fun group, Laura. I’m craving streusel now. I definitely agree that apples and streusel is a match made in heaven, and your bars look delicious. After all these years I finally got used to calling them bar bookies, because in Australia they are called a slice. Mmm, apples and streusel. Such a good pair! 🙂 These look delicious! wow! these look like a great treat with a cup of coffee. What a wonderful fall bar, Laura!